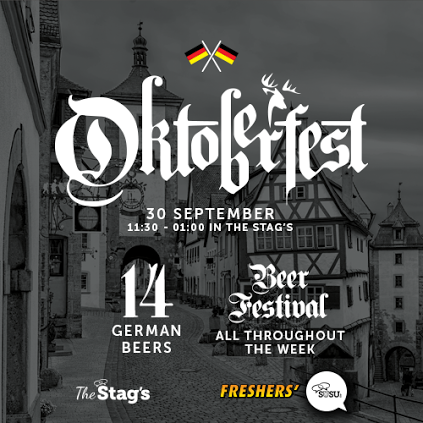 Whether you’re a Fresher or returning for your final year, we know that one of your favourite (or soon to be favourite) venues around Southampton is our on campus pub, The Stag’s. Whether you’re grabbing a coffee before a lecture, or enjoying a pint and a game of pool in the evening, it’s one of the best places on campus to relax. Want a classy night with your new flat? Or are you a cheese fiend determined to find the perfect brie? Well, whether you’re a fresher or final year, undergrad or postgrad (or lecturer!) 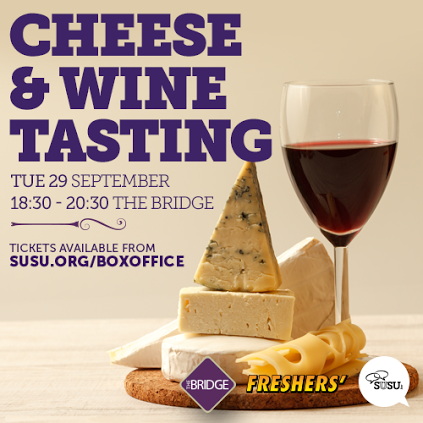 we have the perfect event for you, another instalment of the ever popular Cheese & Wine Tasting evening. Join us on our hugely successful evening of Cheese & Wine Tasting where you will be served with a selection of the finest cheeses Hampshire has to offer, complimented by a wine pairing straight from The Bridge Wine List. 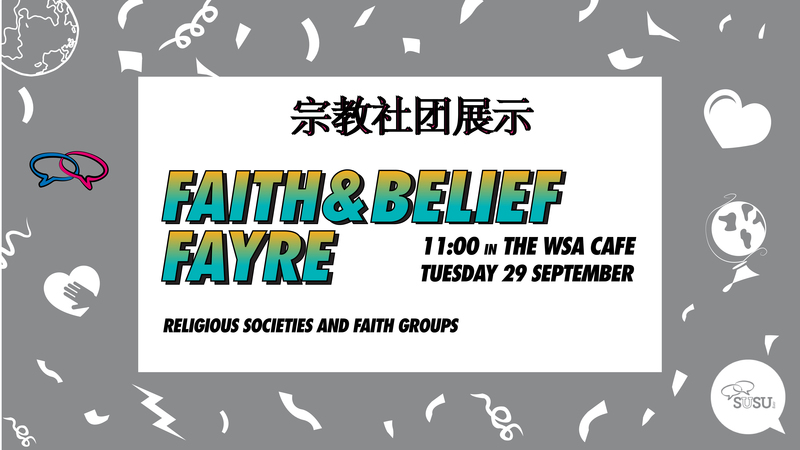 WSA student guest blog: WSA Faith and Belief Fayre happening now! Calling all Winchester students! We know that even with easy access to transport that can take you to the Highfield Campus, Winchester School of Art (WSA) can still seem very far away from all the events happening in Southampton. This year’s Freshers’ events have been wilder than ever. We have had three amazing welcome parties with Southampton University alumnus and Radio 1 DJ Chris Stark on the ones and twos, our Disney cocktail evening and the murder mystery night in the Bridge, amongst others. But coming up this week we have one of the big ones. 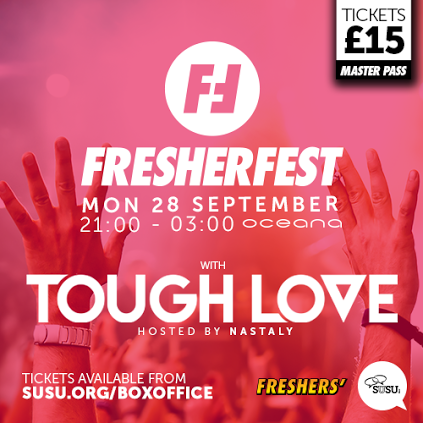 Tonight marks one of the craziest nights out of the year: Fresherfest 2015. Back again due to popular demand, our sell-out spectacular is by far the most DAZZLING and JAW-DROPPING show you will ever see! On Wednesday 30th September, you are invited to a luxurious evening of Burlesque and Cabaret, courtesy of the Hundred Watt Club from 7pm at The Bridge. If you are a WSA student, or you missed the Union Fayre on Monday, then not to worry. 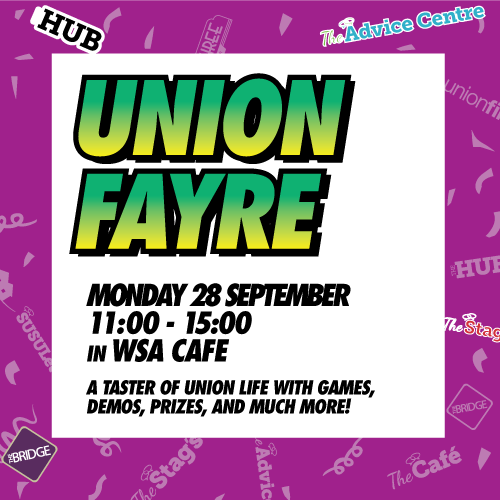 This year is all about making our Freshers’ events bigger and better, so we have organised a WSA Union Fayre on Monday 28th September from 11am-3pm at Winchester School of Art. Expect stalls from our Union outlets, activities, games and of course, lots of freebies. Remember to like The Union – Winchester Facebook page to keep up-to-date with all of the latest WSA news and events. Great Gatsby Dinner Dance: What’s it all about? 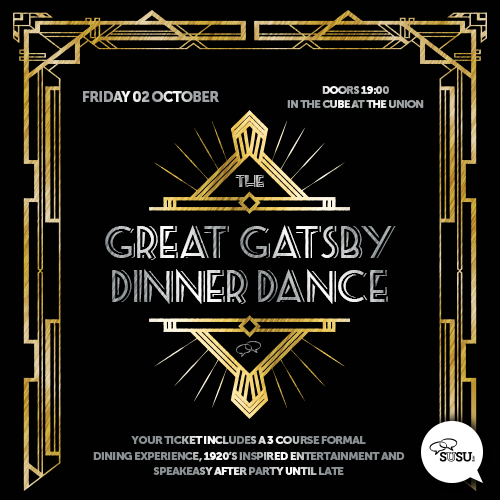 You are cordially invited to step back into the 1920s for our Great Gatsby-themed Dinner Dance held on Friday 2nd October from 7pm at The Cube. After a hard week of partying, this is the perfect event to add a touch of class to your Freshers’ experience. Enjoy a three-course dining experience, prepared by our very own Michelin-trained chef to most likely rival any student cooking (ahem..baked beans anyone?) all included in the ticket price.The menu has been announced and any dietary requirements can be fulfilled by emailing: events@susu.org before Monday 28th September. Moving to a new area can sometimes be daunting. Whether you are concerned about making friends, or you simply want to know the best places to to hang out, we understand that it can take a few weeks to adjust. 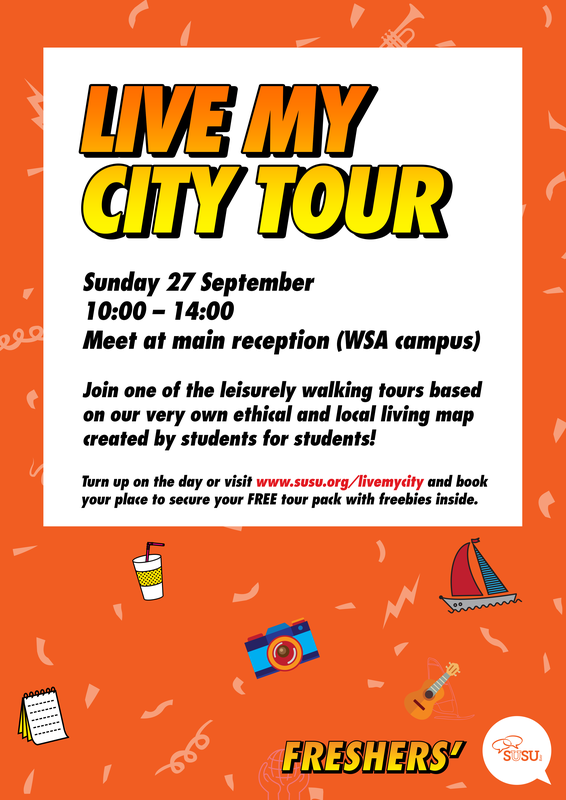 So to make the transition easier for you, we have organised ‘Live My City’ walking tours around Southampton and Winchester. The first tour is tomorrow around Southampton. You can join us from 10am at the Red Brick Area of the Students’ Union at Highfield. And your University experience will be just that. It isn’t all work at Uni, there are lots of ways you can relax whether you’re a Fresher or you’re a returning student. 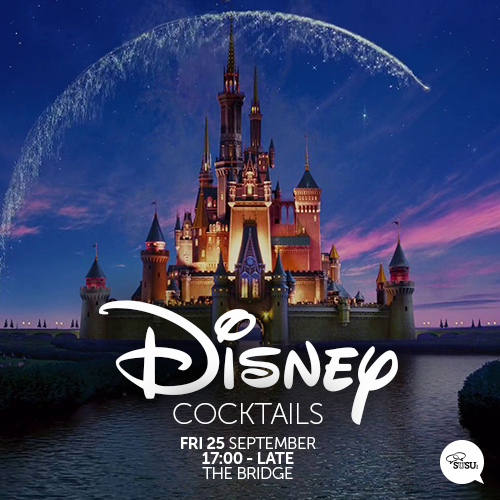 You can relive your childhood at our spectacular Disney-themed cocktails night on Friday 25th September from 5pm at The Bridge. Reminisce about your favourite films, exchange quotes and enjoy a cocktail at the same time! For most people, chocolate is a bit of a guilty pleasure; it tastes great but should be eaten in moderation! Well at this event, all that changes, as we host our very own Willy Wonka Chocolate Party! 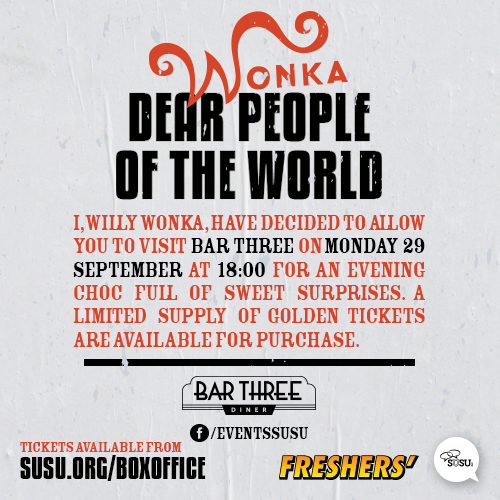 Willy Wonka, of Charlie and the Chocolate Factory fame was the ultimate chocolate expert, and we are going to be bringing enough chocolate to transport you to his factory on Monday 28th September!